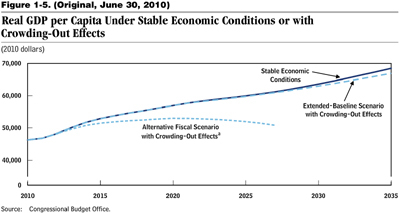 As Dean Baker pointed out last week, the deficits in the Alternate Fiscal Scenario had hardly changed since the previous long-term estimates last year. Thus, the deficit costs to economic growth implied in this graph could not be consistent with the smaller costs reported last June. 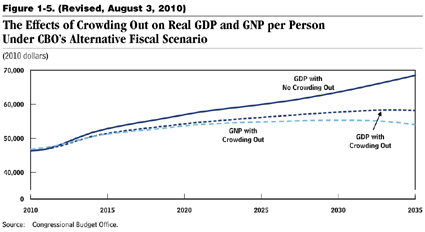 The updated figure from CBO released today shows much smaller effects on GDP. CBO should be commended for its rapid response in addressing this error.